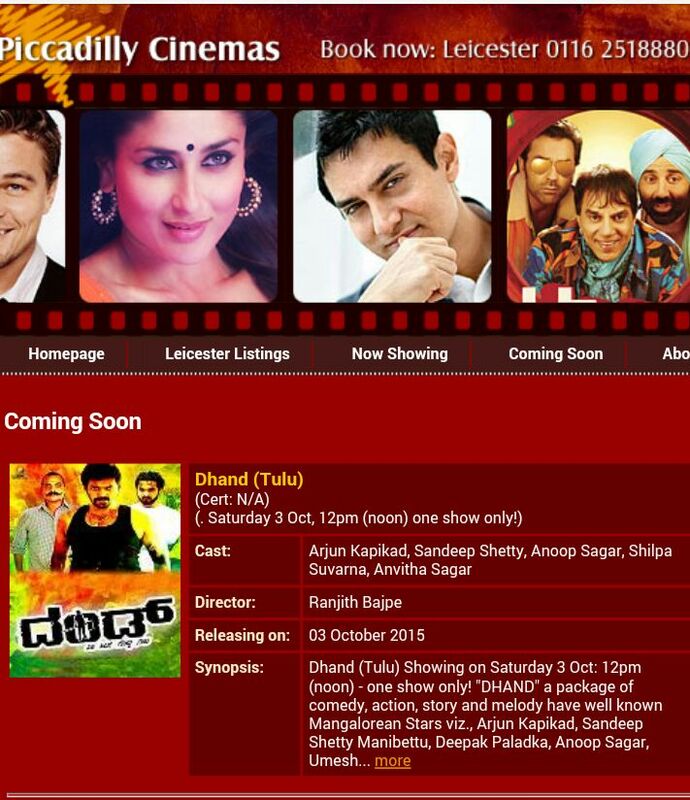 "DHAND" film on 3rd October to be the first ever Tulu Film release in U.K.
Sandhya Creations second venture 'DHAND' after being recently successfully launched in UAE with three shows is all set to release in Leicester, U.K. at Piccadilly Cinemas, on Saturday the 3rd October, 2015 at 12 pm noon. This will be in record the first ever Tulu Movie release in U.K. as DHAND did in Australia recently. DHAND ran successfully in Mangalore for around 70 days and had many shows screened in Mumbai & Nashik with more shows in the pipeline. The Organisers are busy preparing for the mega release as the posts are already http://canaranews.com/uploaded in the Cinema Guides, Social websites and Mangalorean connections over there. DHAND movie narrates a tag line which says "There is always a “Hero” hidden within every person. Friends, Fun, Love etc. keep the “Hero” within him busy throughout his normal life. But when he sees injustice to his loved ones, then only the real Hero within him will arise to fight against the injustice". The fight is against drug abuse and atrocities towards women which is the real menace in many parts of the world. This female oriented movie has been acclaimed one of the best storyline ever made in Tulu Movies so far with a good social message and has been appreciated wherever released. Students from Schools and Colleges were requested to watch the movie in groups from various Institutions and have witnessed this already. A beautiful romantic song, "Nina Teliken" sung by Sonu Nigam was shot in 4 days at various locations in Mangalore. This song was shot keeping in mind the theme of 3 environmental conditions of mother nature like Greenery, Water and Dry. The film is being entirely shot in and around beautiful natural locales of Mangalore. A Marriage song, “Ora Oppi Bokka”, was shot during night in a traditional house near Yekkar, Mangalore. Intro song, ‘Hero Yaanavodu’ is pictured on Arjun Kapikad was shot near Panambur. Interestingly an Item song, ‘Gammathu’ is introduced which is shot on Anoop Sagar and Ameeta Kulal which was captured at night in sensuous "Red Rock Resort" near Surathkal Mangalore. The melodious music of the film is composed by Abhishek S N, a software engineer by profession from Bangalore, (who had earlier composed music for the Sandhya Creations first International Tulu film NIREL), for which Swapnil H Digde has assisted him as a music arranger. Abhishek has also sung for DHAND and has provided electrified background score. Dhand of Sandhya Creations is Produced by Shodhan Prasad with Story Written & Direction by Ranjith Bajpe of Nirel fame having Arjun Kapikad playing protagonist of the movie along with Sandeep Shetty, Nirel fames Anoop Sagar performance in a negative role was really appreciated along with Deepak Paladka who acted as main comedian, supported by Gopinath Bhat, Umesh Mijar, Ranjan Boloor, Shilpa Suvarna, Anvita Sagar, Nidhi Maroli & Shodhan Prasad playing major roles in the movie along with other actors. It had beautiful songs penned by lyricsts Rajneesh Amin, Loku Kudla & Ravichandran Sonandur for the Music composed by Abhishek S.N. Mixing and Mastering of the music was done by Swapnil Digde. Karthik Mallur captured every bit of the movie as DOP while Sujith Nayak did the editing part perfectly. For the first time Surakshitha Shetty was introduced as Costume Designer. The action pack was by Ultimate Shivu and choreography by Akul N. DHAND has Kishore Mudabidri as Associate Director and Rakshith Karanath Kulai, Surakshitha Shetty, Venu Shetty Mulki and Subhash Bangera as Assistant Directors. Publicity Designs were done by Yathiraj U.S. , Stills by RBK Jayaraju and Publicity Stills by Thilak Photography, Mangalore.